Fees associated with filing trademark applications in Australia as well as other trademark fees are available in the fee calculator. Multiple-class trademark applications are possible in Australia. - confirmation that the application fee was paid. Convention priority is to be claimed on filing the application or within two days thereof. A certified copy of the Priority Document may be required during examination; and an English translation of the document (if in another language) with a certificate of verification relating to the translation. Submission of the Power of Attorney is not required for trademark registration in Australia. The process of examination consists of a formal examination, an examination of distinctiveness and a search for prior trademarks. If accepted for registration, the trademark application is published in the “Australian Official Journal of Trade Marks”. Opposition against a trademark in Australia may be filed within two months from the publication of acceptance date. The official grant fee for a trademark certificate must be paid within 6 months from the date of publication in the official bulletin. The trademark registration in Australia is valid for ten years from the filing date. Trademarks may be renewed for consecutive periods of ten years within 12 months before the expiry of the validity term. Late payment is possible within a six-month grace period by paying a corresponding surcharge for each lapsed month or part thereof. Once the application is filed, it takes approximately 7 to 24 months to register a trademark. If a trademark in Australia has not been used within a continuous period of 3 years since registration, the registration may be cancelled on the basis of a third party’s request filed not earlier than 3 years from the filing date. For foreign applicants, it is recommended to perform patent prosecution in Australia using an agent - a registered Australian and New Zealand patent attorney. 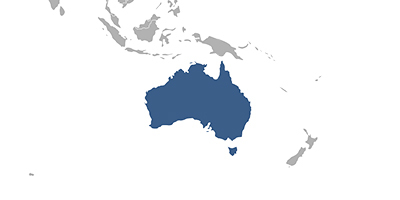 Online Search Databases: Australian Trademarks, International Trademarks.